Rent villas and apartments in Malgrat de Mar, Spain with swimming pools. Book affordable holiday rentals that are near a beach and golf course. This fabulous holiday home with spectacular sea view of Santa Susana is situated only 2 km from the beaches of the Maresme, in a quiet, sparsely populated area. This 1 bedroom apartment with swimming pool is located in Malgrat de Mar and sleeps 4 people. It has WiFi, air conditioning and a garden. The apartment is within walking distance of a beach. This cozy holiday home is located on the Costa de Barcelona, in the urban area of Malgrat de Mar. It has a private pool. Thoughtfully decorated, modern apartment with a great view of the beach from the terrace. This is a nice apartment with elevator, right at the beach front of Malgrat de Mar. The balcony offers an exquisite view of the huge shared pool. Football. Modern, fully equipped apartment just a few meters from the beach. 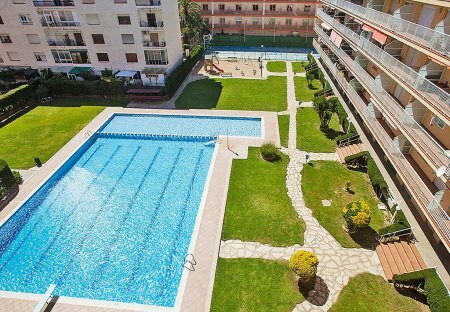 Close to the beach of Malgrat de Mar you find this cozy apartment on the 3rd floor in a residential complex with communal pool. This modern apartment is located directly on the beach in a very lively area of ​​Malgrat de Mar. This 3 bedroom apartment with swimming pool is located in Malgrat de Mar and sleeps 5 people. It has a garden. The apartment is within walking distance of a beach. In a quiet district, less than 200 meters from the beach and only a few minutes walk to the village center, is this cozy holiday duplex. This cozy holiday apartment is located on the 6th floor of a residential complex with communal pool, just 250 meters from the magnificent beach of Malgrat de Mar on the Costa de Barcelona. This 3 bedroom apartment with swimming pool is located in Malgrat de Mar and sleeps 6 people. It has WiFi and a garden. The apartment is within walking distance of a beach. This semi-detached home is located in the centre of Malgrat de Mar, in the province of Barcelona. 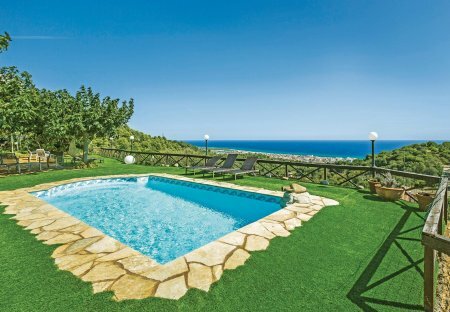 This 3 bedroom apartment with swimming pool is located in Malgrat de Mar and sleeps 5 people. It has WiFi and a garden. The apartment is within walking distance of a beach. This bright, well equipped apartment is located directly on the beach promenade. Guests can relax in the communal pool or on the terrace. This practical holiday apartment is located directly on the beach on the road which combines Malagrat de Mar and Santa Susana. With communal pool area. Cozy holiday apartment just 250 meters from the beach of Malgrat de Mar. The apartment is located on the 1st floor in a gated community with elevator and is ideal for a family vacation.